The TS DOST seat allotment 2017 second phase registrations will begin on June 25. The second phase of the seat allotment will be done on July 3. 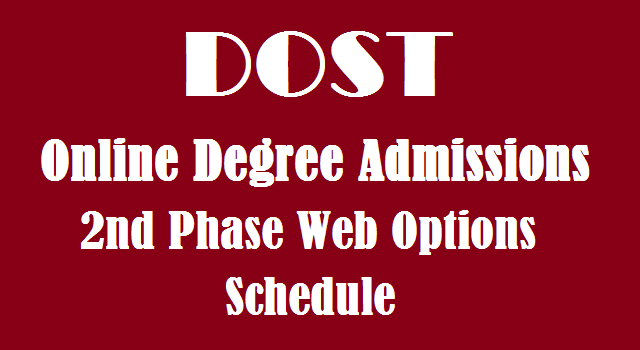 The second phase registration and web counselling for admissions into degree course through the Degree Online Services, Telangana (DOST) will be from June 25 to 30. Osmania, Kakatiya, Telangana, Mahatma Gandhi, Satavahana and Palamuru Universities have issued the Online Degree Courses/Under Graduation(UG) Courses admission notification and Online application forms are invited from the eligible students through online mode for registration and admissions into various ug/under graduate courses, such as B.A., B.Com., B.Sc., B.B.A., B.C.A., etc., offered by various colleges affiliated to all Universities in Telangana, which includes Constituent, Government, Aided, Autonomous and Private Colleges for the academic year 2017-2018. Colleges can access their College and course wise seat allotments from ccets.cgg.gov.in. The second phase of web options would be announced from June 18 to 19 while the second phase of seat allotment would be done on June 22. Students should report to their respective colleges from June 23 to 28. 2. If not received, Use Allotment Confirmation OTP Service on the DOST Web Site. This OTP will be valid till 24th June 17 midnight 12PM. 1.Biometric Authentication Service for Phase-II is enabled in all the HLCs / UHLCs/Meeseva Centers. 2. Students who registered already in Phase-I can directly access web options for participating in Phase-II( Either BMA or Payment of Rs100/-or Filling of Application is NOT REQUIRED). The second phase of counseling for Admission in Degree will be held from 17th of this month to 20th of this month, Satavahana University Dosth coordinator Dr. D Harikant said. New students have suggested to get their Aadhaar Card, Biometric Authentication, Registration in helpline centers at these service centers. From June 21 to 24, online web options and allotment of seats on 28th and those who have seats will be required to report to their respective colleges from July 29th to 3rd of July. From July 4 to 8, the final phase of web options will be available and students from July 14 to 18 will have to report to the allotted colleges. Intermediate Advanced Supplementary Examination appeared candidates are suggested to apply for degree online courses so far. Fingerprints and Irish not connected with Aadhaar candidates need to have fingerprints on the back of the token. Those who missed the token number should contact the helpline center immediately. In the first phase, all those who have been allotted the seat must go to cellphone and finalize their seat. If it does not do so, there is a scope of the cancel seat. Can choose colleges that are associated with court cases in web options. The list of previously selected people was put in Withheld. You have to choose a different college. This is to contact helpline centers. *Ensure the MOBILE NUMBER ENTERED IS CORRECT AND BELONGS TO THE APPLICANT ONLY while registering. *Students can EDIT certain Fields Now. *Using Mobile Phones for Payment, Filling Application and Web Options is NOT RECOMMENDED. Disable DND (Do Not Disturb) mode. 1. Paying Rs100 does not mean you have completed DOST Registration and your seat is secured. 2.Your Registration Process completes only when you complete web options and submit. 3.You will receive a SMS about your allotment. 4.You must report to the allotted college with your ALLOTMENT LETTER to confirm your seat. 5. Exercise DELETE option cautiously by visiting a nearby HLC. 1. Registrations for Phase III are opened now. All fresh registrations and filing of student applications are allowed now. 2. Web Options for Phase I, Phase II and freshly registered students is available now. 1. Students intending withdraw from their confirmed seats can now submit a request from their DOST logins. 2. Use Withdrawal Request and submit. 3. You will receive a SMS on approval and then download withdrawal letter. The final Phase of DOST registration schedule is announced. The Registrars of Six Universities are requested to give wide publicity about the Final phase of DOST admissions schedule. 1. Necessary arrangements may kindly be made for certificate verification of Other Boards and Special category candidates. CGG will send SMS to such category students. 2. It is observed that some students just registered in DOST and did not upload the application form in Phase –I and Phase-II. Some other registered and uploaded application but did not exercise any web option. Therefore, such candidates may be informed now to utilize this opportunity and motivated to give maximum number of web options. 3. Some students have given few web options in Phase -I and Phase-II, as result they could not get a seat. These students may be informed to through press note to give maximum number of web options in Final phase. due to exercise of such option in final phase, the seat already allotted to them earlier will be allotted to others. 5. The candidates who got a seat in second phase and NOT confirmed their seat at the college can also exercise web options in Final phase. 6. Registrars are requested to convene a press conference and provide the above mentioned information for the benefit of the student community.